On 14 February 1949, France issued a set of four stamps showcasing some of the many trades that have been and, in some instances, continue to be, the life blood of the country. Two of the stamps in this set, the 3f+1f value and the 8f+4f value, were designed and engraved by Albert Decaris. The 3f + 1f value celebrates the French farmer. The 1f surcharge on this stamp went to the Red Cross. Farming is one of France's most important industries. in no small part due to the fact that the country is self-sufficient in food supplies. Farming in France ranges from cereal crops to beef, pork, and poultry to a range of fruit and vegetables. In the above stamp, Decaris has illustrated a farmer ploughing a field in an old tractor. 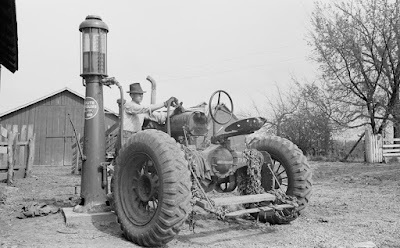 Out of curiosity a had a bit of a look on the net to see if I could find a tractor that resembled the one here. This is what I found. It is, I think, pretty close. Unfortunately, I wasn't able to find a make for this particular vehicle. Anyone have any idea? The 8f + 4f value celebrates the hard-working miner. The 4f surcharge on this stamp went to the Red Cross. The French have practised Coal Mining from as early as the 12th Century. 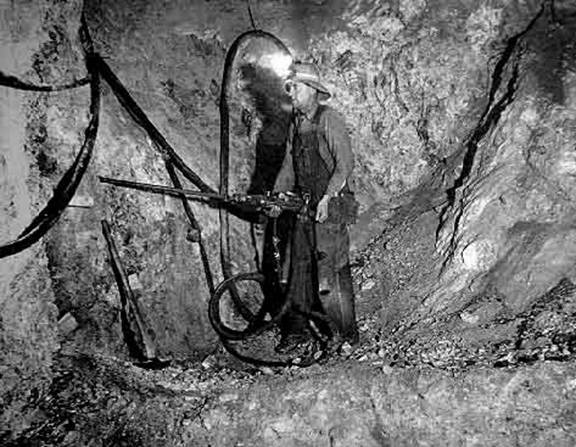 But it wasn't until the 19th Century that coal mining really accelerated and many new mines were opened. The main areas for coal mining in France were located in the north-east in the Nord-Pas de Calais, in Lorraine, and in the Loire. And Lignite was mined in the south-east in Provence. 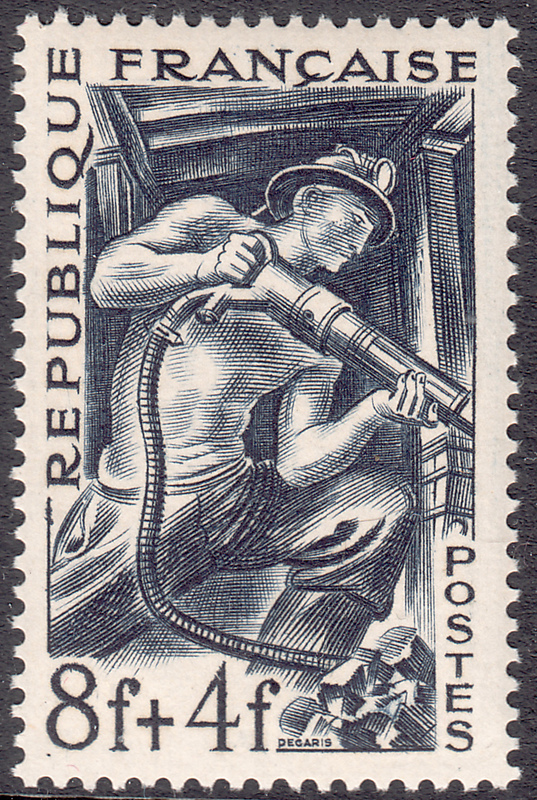 In this stamp Decaris has beautifully depicted a robust miner wielding a pneumatic drill and showing the rock no mercy. The drill used by the miner on the above stamp is similar to the real one in this image. I bought an old map on Delcampe last week (May 2018) and was surprised to find that the vendor was using up some old mint pre-Euro postage stamps. 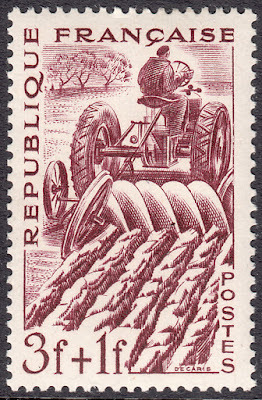 there were four on the envelope - the Centenary of the Pneumatic Network in Paris (1966), a 0,40fr se tenant with a Juin 1970 label "Perigeux 1re emission", an undated 10fr with Marianne on it and, oldest pf all, the 3fr+1fr shown here with the tractor - finally used after almost 70 years sitting mint in an album! I've had people use old US stamps in the past on eBay purchases, but never quite as old this one. France 1951 - Stamp Day.